For the longest time now Amazon has been releasing updates for their apps, new Kindles, and the Kindle Fire while sadly neglecting the now 2 year old K3. This ereader didn't die last year when Amazon released the newer models, but was instead kept around as the Kindle Keyboard. But that was about all Amazon did as they turned attention to the newer gadgets. Today that changes. Amazon has rolled out a new update for the K3 which gives it all the latest features. If you've been holding on to your old device, today you get rewarded. 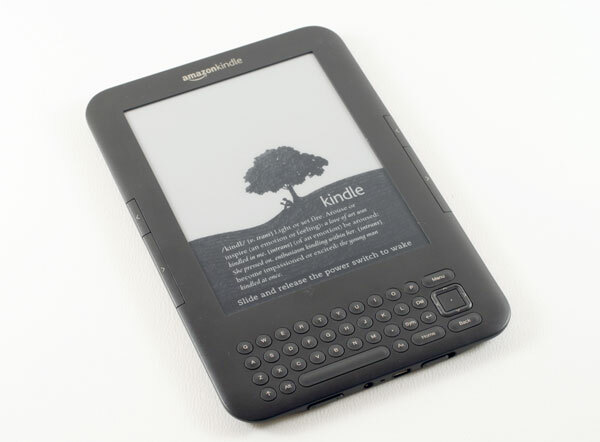 The K3 now supports the KF8 ebook format, which offers near Epub quality of formatting. (Dropcaps, wrapped images, and embedded fonts, oh my!) And this update adds support for the Kindle fixed layout format. Now you can read the digital comics, children's books, and magazine titles introduced with the Kindle Fire last fall. This update also adds the parental controls features which Jeff talked about so much last week. Parents can now restrict access to the web browser, Kindle Store, or Archived Items. Even if you're not a parent, I'm sure you can appreciate not having to worry about some fool buying stuff on your Amazon account. And the K3 also now can support Whispersync for voice. Now you can switch back and forth between reading and listening without losing your place. Whispersync for voice will sync your reading position on any Kindle with Audible playback on Kindle Keyboard, Kindle Fire, or in Audible apps for iPhone and Android. Of course, you have to buy both the ebook and audiobook, so there is a downside. But this is still going to be a fun feature. Last but not least, the K3 also gets the improved fonts which rolled out to the K4 back in June. That's the one that has been improved to have more contrast and be more crisp. There's a lot to take in, so much so that I almost didn't notice that the K3 still lacks X-Ray. And I'm also half expecting that this update will take away the free web browsing over 3G. But I don't have a K3 handy to test so I will have to wait for user feedback. Ironically, it is the Kindle Touch that is now most in need of an update (unless you count DX/DXG). It does not support fixed-layout KF8. I expect there will be an update for that (perhaps bringing it to feature parity with KPW). How about us DX users? I have DX 2, perfect format for me and I am not about to jump the wagon, at least until de paperwhite is officially available in Europe. So an update would be really nice for the DX too! I think the K3/Kindle Keyboard is Amazon’s answer to folks who say they aren’t helping the visually impaired. I think if you can’t see at all or can’t see well, you are better off with a keyboard interface than a Touch Screen.- It might be that they killed text-to-speech in the new Paperwhite because they see the Kindle Keyboard as their solution for visual impairment. The Paperwhite’s light and white screen might help the impaired but they certainly aren’t much use if you’re totally blind. Carmen, I agree with you on all that. I have both the K3 and a Fire. I still prefer the K3 for reading text based books and documents. I use the Fire for PDF’s and cookbooks and books with graphics. I prefer the K3 because of the forward and back buttons, light weigh and long battery life as well as the easy to read screen. Better fonts will be welcome as well as KF8 support. Now if they could only cure the slows as it fills problem! I’m so glad to see this – I love the keyboard too much to ever go for one of the new ones – but oh, I would just love to see them come out with a Kindle Keyboard with Paperwhite! Sigh… not the improvements I was hoping for. I don’t really care about any of those things, I just wanted performance improvements. Like not spontaneously restarting every time I sync just because my archive is over 3,000 ebooks. Or every action except for page turns being excruciatingly slow, even though I’m only using 1/3 of the available space. I won’t be turning on my WiFi for this update. Why would you keep 3000 books on your Kindle? Why would you not keep 3000 books on your Kindle? It has 4GB of flash, which is enough for thousands of books. But if you try to use all that storage it locks up, reboots or otherwise falls over in numerous random ways. I don’t see any benefits to it, I’m just using my computer as a library. The Kindle’s issues with large in-device libraries and slow loading/indexing times when there are XXXX number of titles on it are fairly well known. Sideload the update(s). Many on the Amazon fora were reporting that the latest update cured the rebooting problem because it restricts access to the archive. I gave my sister the tip and she says her keyboard has worked flawlessly even with the wireless on since she sideloaded. Does anyone know whether the KK update has any text-to-speech improvements or new keyboard shortcuts? I don’t see any improvements to text-to-speech or new keyboard shortcuts. I have 3 Kindle Keyboard devices with problems. 2 have screens that are lined and cannot read through those. 1 has been frozen, unable to be reset. Is it correct that support no longer repairs these devices? I keep buying new ones but would love to have these on standby. I have tremors and these are the best ones for me to handle. Thank you. Hi I dropped my KK a couple of months ago and damaged the screen like yours. I ordered a replacement screen and installation kit from eBay. My Kindle is now as good as new; just make sure the kit you get comes with the double-sided tape to hold the new screen in and that it comes with the opening tool to take the back cover off your kindle.